Add a little oil or butter to a saute pan and saute the onions, mushrooms, and spinach until soft. In a large mixing bowl, beat the eggs together with the milk and S&P. Grease a 9x13 baking dish with butter or nonstick spray. Now it's time to assemble. Place half of the bread cubes in the casserole dish in an even layer, then half of the spinach mixture, then half of the cheese. Repeat with the other half of each ingredient except the cheese. Pour the egg mixture over everything, taking time to let everything sink in as you pour. Press down any pieces of bread that are not immersed. Cover with foil. If you're making it ahead, place in the fridge overnight, or until you're ready to bake. Remove from the fridge about 15 minutes before you place it in the oven. Bake at 350F for 45 minutes. Remove foil. Top with the other half of the cheese. Bake for 15 minutes longer. If you're really pressed for time, no one will condemn you if you just toss the bread cubes, spinach mixture, and cheese in a big bowl and then dump it into the casserole dish instead of taking the time to make layers. It'll still be delish! If you've made it the night before, turn the oven on when you take the casserole out of fridge. Then the oven will be nicely preheated by the time you're ready to bake! 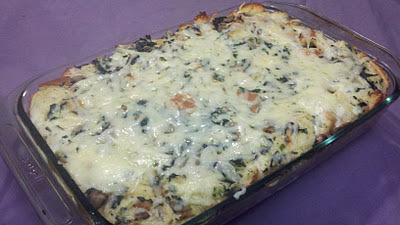 If Swiss cheese, mushrooms and spinach are not your favorite things, then change it up however you like! Asparagus, broccoli, cheddar cheese, diced ham, sauteed sausage or bacon, diced red bell peppers... all good! There's really no right or wrong. You can basically use any kind of omelette ingredients and it will work perfectly!